I am officially qualified to make art. Yes I mean it, I have a bit of paper, which only I and the person who shoved it in an envelope has ever seen, that says Robert Adams, Ba Hons Sculp (3rd class). Which is as near, I might add, as it is possible to get on a Fine Art course to failing, but none the less it confirms I have the power. I can look, or even if I am bold intervene on an object, and with a wave make it art. Move it from the category of the mundane to an elevated existence. Ok, Ok waving is probably a bit too Harry Potter with an Art Wand… maybe just pin an A4 sheet of impenetrable art-speak next to it… Now people will look at this thing differently, they will stroke their chins and ponder, they will feel the need to say that I explore the boundaries of the mundane and the elevated, with a bit of luck they might even pay me so they can stroke their chins at home and impress their friends with their avant-garde taste in art. Great power, as Spiderman’s Uncle Ben once said, comes with great responsibility. I could theoretically pin a bit of paper on the Child Okeford village noticeboard declaring the whole village art, or even the whole of Dorset, drunk with power I could claim the entire universe as my creation and artify the whole shebang! Tricky to exhibit I suppose, just an A4 in an empty gallery declaring my act of will would do it though. Ah yes I can see it, a pure white cube of empty space with a single sheet of paper on one of the pristine walls. The Turner prize would be a shoe in, Kirsty Wark would interview me in that humble mortal talking to a high priest manner she has, hanging on my every statement concerning my realms of concern and posing deferential enquires as to how I became such a genius. But maybe best not, how will everyone feel to be just the raw materials for my art? What if someone objects to being merely the paint on my conceptual brush? I could of course put my bit of paper in a locked box and declare that within it lay the greatest creative statement ever. Hmm that might be enough for the prize in itself! Me not saying what it is would become part of the work and no one would need to know that I had artified them and the entire multiverse without asking first. Lets try it there is nothing like experimental evidence. Here is my breakfast in a mundane state. 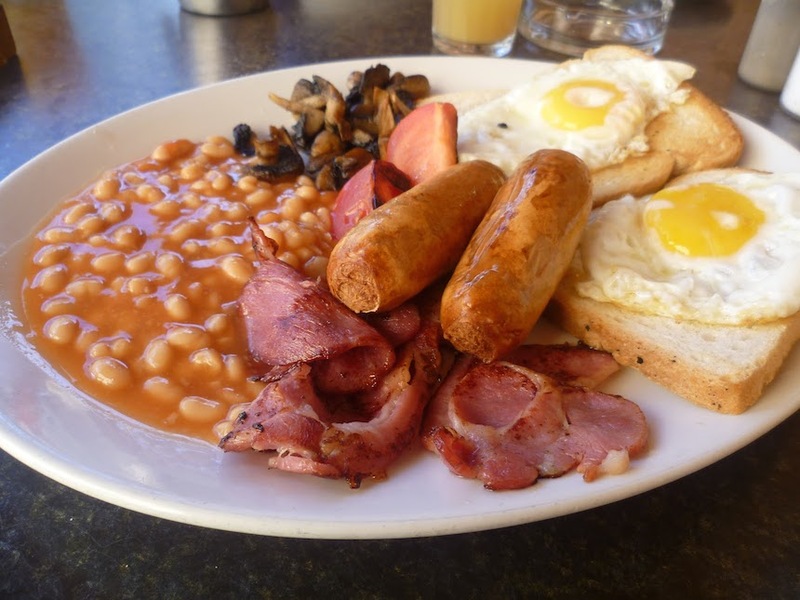 Well that pretty much proves it, the breakfast is just breakfast again with no subtext. This is going to cause a storm in the art world I fear. What if Anthony Gormley de-artifies one of my paintings? Do I retaliate in kind and de-art the Angel of the North? I can envisage two artists duelling each arting and de-arting objects by pinning A4 conceptual declarations in turn. Some miscreant could pin an A4 sheet saying “This is not an Oak Tree” next to Michael Craig Martin’s seminal work. What if someone de-arts the Sistine Chapel? Would the people stop going? The Pope would have to get Damien Hurst in to re-art it or the Vatican would be very much out of pocket. Well we all do, don’t we? My interest in this post is how those “likes” are shaped. Also, as artists, should we allow those likes to shape the work we do? This is prompted by the experience of putting up studio paintings and the sketches for them on social media. You can guarantee that people will pipe up to say that they far prefer the sketch. However in my last show I had several sketches and the paintings that finally resulted on the wall together. The studio pictures got the gaze time and the comments , the sketches mostly got ignored. The computer screen of course puts a 24inch oil and a 7in watercolour on an even footing which might be part of the reason. This led me to consider what element of appreciation of a thing is taught to us by our upbringing and peers. A Victorian person would I suspect find a modern minimal apartment sparse and unwelcoming, and a thirty something today would find a Victorian parlour cluttered and dark. Both spaces might be perfectly practical to live a life within, so I would suggest that the way we choose to perceive them has changed. This has ramifications for how I paint I feel. There are many ways of looking at a painting. Take a Breughel and just do a quick glance. What did you get? My guess is not a great deal just a general impression of complexity. Take a Munch, a quick glance at “The Scream” is a very different experience, the image delivers its freight of emotion instantly. Which one would reward the most if it was on your wall for a year though? My guess is that it is the Breughel that would garner the most looking time. I am not, I hasten to add, assigning artistic merit by this measure. Only proposing that there are many different ways of looking. There is the quick high impact look, over in a moment, and the long accumulative look that might take years. Logically there must of course be all sorts of other ways and durations of looking. For many, painters especially our fast forward world today, the quick look or impression is all important. I hear the phrase “Over worked” or “Tight” used if anything is at all detailed or finished. The holy grail is looseness, expressiveness and freedom all of which cater for and aid the rapid appreciation of a work. None of these things is true of the Breughel though, but I still feel his paintings are among the great artistic creations of man. Artists tend to scorn detail, but the general public stubbornly loves it. I myself cringe slightly when someone says one of my pen drawings is wonderfully detailed. I want to protest out loud that it is mostly only random hatching that they are interpreting as detail that is not actually present. I have to conclude I suppose that in large degree we like what we are taught to like. Extending the range of what we are able to appreciate takes effort and an open mind. I am always nowadays a little uncomfortable uncomfortable when another artists dismiss and entire genre of work with a wave. “Mere Illustration” is one I hear a lot, I counter with the fact that the Sistine Chapel ceiling is illustration, but usually to no avail! If something is illustrative it is of a lower degree, what I am trying to say here is that such opinions are often more guided by fashion rather than actual aesthetic consideration. Sadly it sometimes seem the case that people don’t allow themselves to enjoy certain things. They have a set of criteria that guides what they will appreciate. So a Victorian morality piece by Quiller Couch Orchardson would be dismissed even if it (as they mostly were) was beautifully composed and painted. Even more oddly these criteria have a strange irrational flexibility, so a Hieronymus Bosch from the 15C might be appreciated as art but a contemporary image in a similar vein might be dismissed as “fantasy” and not given a fair look. I am far from being immune to this kind of snap judgement myself, but do attempt to make the effort to recognise that the “automatic” assessment might be poorly founded and take a second look. 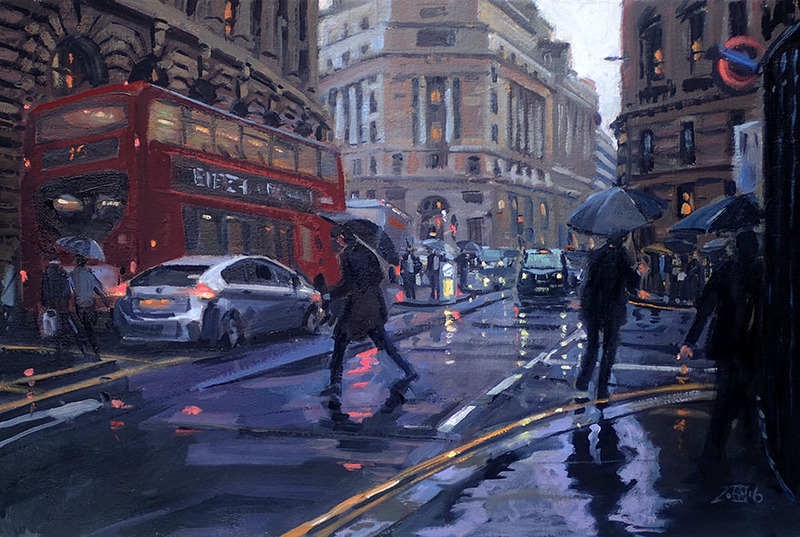 Due to the dampness in France I did more oils than I expected in France, which got me fired up to do more on my return. 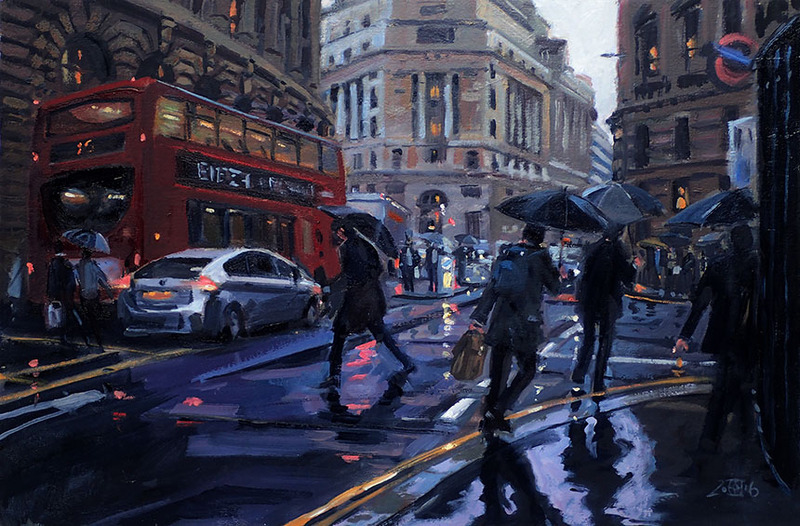 I am trying to paint each day in “office hours” which does really help to keep the paintings coming. This is Fontmell Down, I went up to do the main view which I have done several times before. In the end though I did this less dramatic subject, it is really just a cloud study. 10in by 14in Oils. 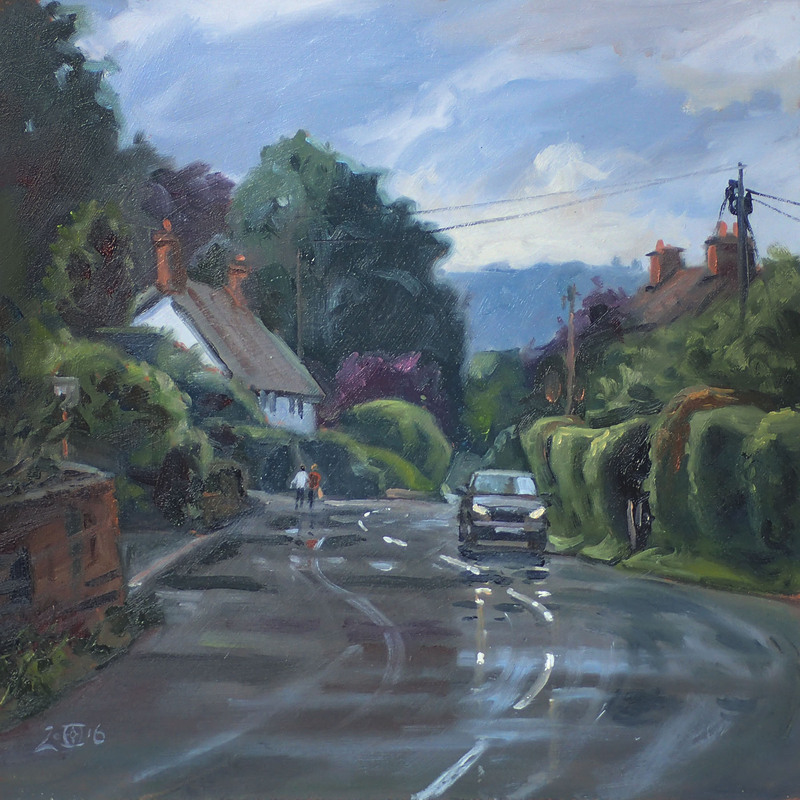 I haven’t managed to do many plein airs of my local village Child Okeford so this moment when the sun glimmered through after rain was fun to do. I might re scan it as it was very wet when this was done which makes the tones cruder than they really are. 12in by 12in Oils. 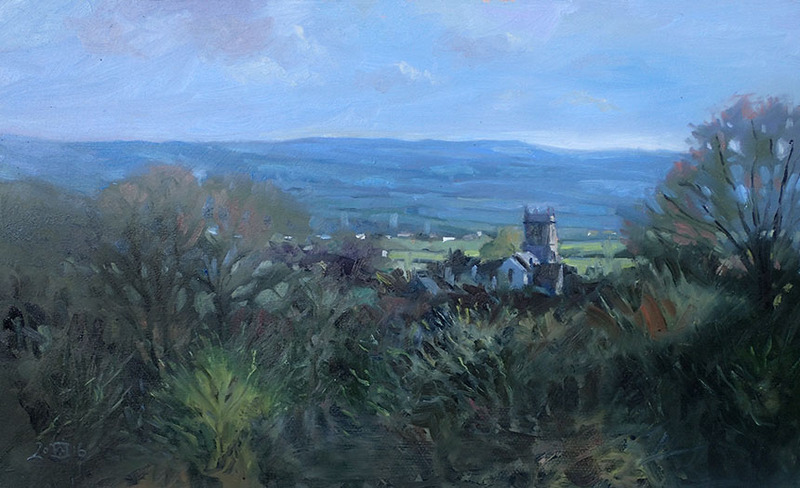 This is St James’ seen from Shaftesbury. I actually started this last year but got stuck. It seemed to have potential when I was going through my heap of unfinished and outright disasters so I set about finishing it. 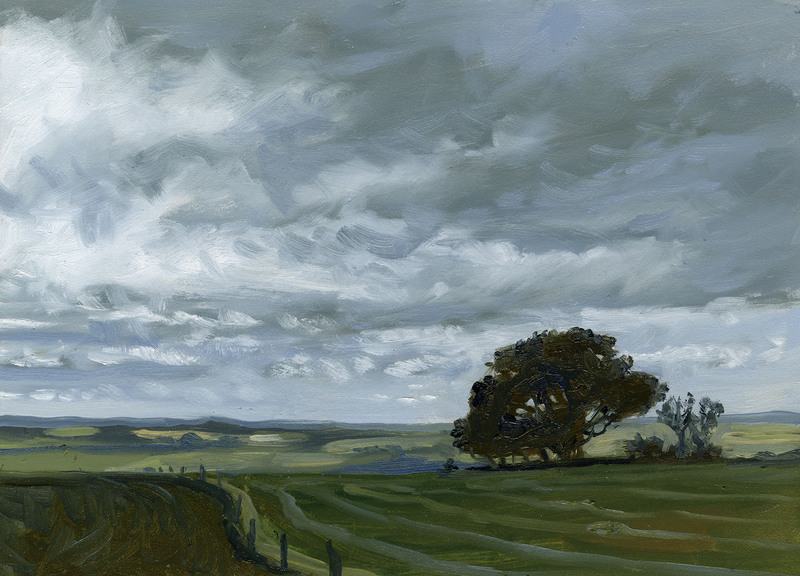 It is always hard to paint big areas of nothing much that have to be vaguely like undergrowth and layers of trees. The temptation is to define them and make them coherent, where in real life they are not that way at all. 12in by 20in Oils. 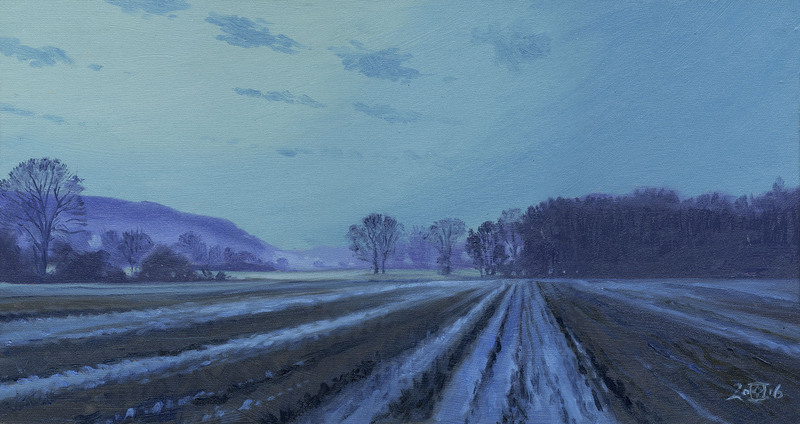 I wish I had photographed the different stages that this one of Hambledon Hill went through. My first lay in felt somehow wrong. It is always annoying when something almost works but you just can’t put your finger on why it misses the target. A few days later when I came back to it I decided to re draw and it then look like a comic strip panel with black outlines. Crude as that was it did allow me to see where to go with it. Some bits may be glazed back yet but am happier with it for now. I made the mistake of posting the watercolour sketch on Facebook which garnered the usual “I prefer the sketch” feedback. I sort of knew this would be the case but to my eye the images are so different in intent that the only thing they share is the subject. 12in by 26in oils. This is a small plein air I did when I was first starting to try and paint the City of London. I always intended to paint a studio version but after this 1oin by 14in sketch sold I never got round to it. I have not done enough translating plein airs into studio pictures so I was quite looking forward to getting to grips with this. Here is the first version, I wanted a bit more dynamism in the figures but after having it on the wall in this state for a while I decided that it wasn’t quite gelling compositionally. So I decided the central figure had to go. 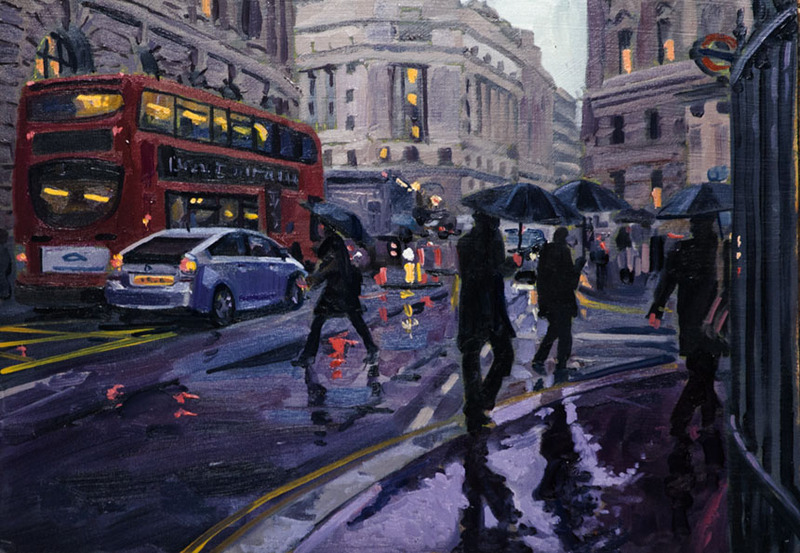 It is always nerve wracking making a big change to a painting that almost works as it can easily end in disaster! Here it is after surgery, much better I feel, the composition takes the eye on a proper journey. 16in by 24in Oils. Another one from the discards pile. This started life as a very quick sketch of Hambledon Hill done at dawn, but as I recall the sun bounced up into the sky too quick for me and I had to stop! I like the still mood though so I spent a pleasant hour or so playing with it. Not much of the original sketch left! 10in by 19in oils. 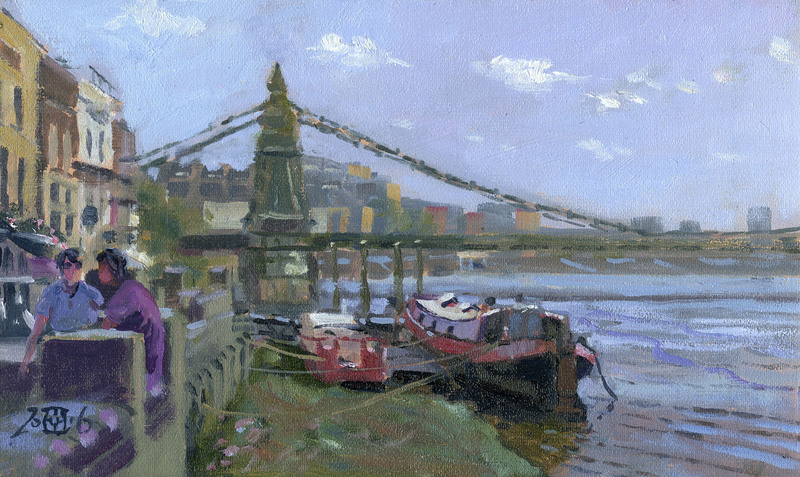 Now my building works are done I can get up to London to paint with the Wappers. The summer at last gave us some sun and heat. 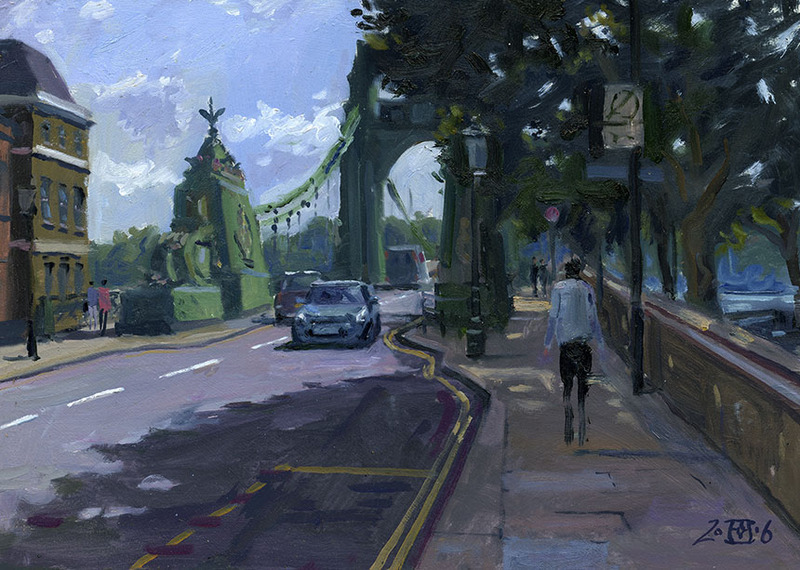 This one of Hammersmith Bridge was very enjoyable to paint, I had almost forgotten what shadows looked like with all the grey days we have had. 10in by 6in Oils. 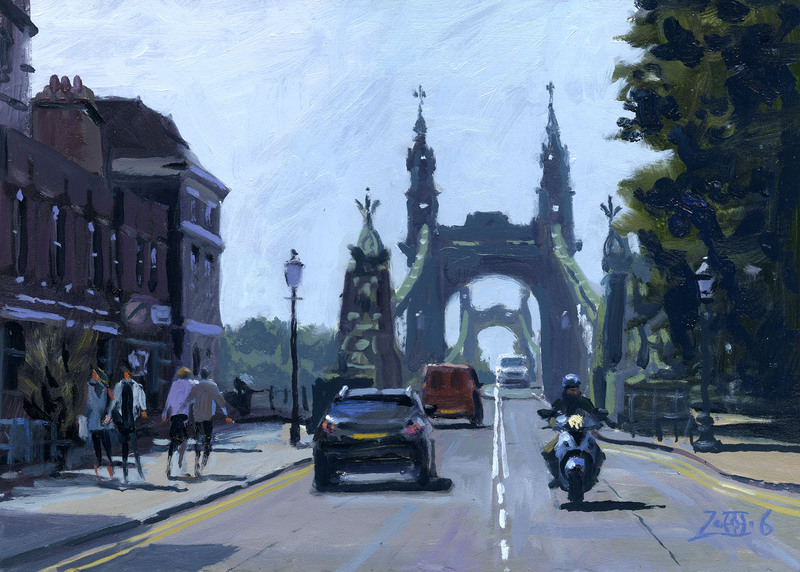 Before the previous painting I had blocked in a painting of the Bridge from the middle of the road here. I had intended to carry on with it but the light was very different and the reservation in the middle was in full baking sun. This looked much more pleasant to paint! I might do a studio one of this. 10in by 14in Oils. Here is the first one of the day finished off. Better composition than the previous one so this might get the studio treatment instead. 10in by 14in oils. That’s all for this instalment, maybe some watercolours need doing next.